Some very high-end restaurants serve a very expensive dish called Steak Oscar, the exact origin of which is debatable. 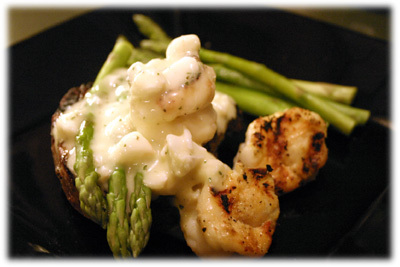 This version is very easy to make at home - high heat and quick grilled beef tenderloin filet, topped with grilled lemon garlic shrimp, asparagus and smothered in a rich, creamy Bearnaise sauce loaded with either chunk crab meat or scallops (or both!). It's such an impressive dish to serve and it looks like it would take you hours to make but it really is surprisingly easy to do. Instead of making your own Bearnaise sauce from scratch use one of the prepackaged ones available in most supermarkets. Knorr makes a very decent sauce mix and saves a lot of time. I've added lemon-garlic grilled shrimp to this recipe which is a variation on the typical Steak Oscar recipe you may find elsewhere but to me it makes this dish the best. And don't forget, load the Bearnaise sauce with your choice of either chunk crab meat or the 100-150/lb size sauteed scallops. 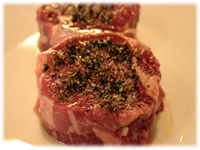 Rub a small amount of oil on the beef tenderloins and season them with a little freshly crushed peppercorns and kosher salt. Cover and keep them at room temperature. Prepare the bearnaise sauce recipe according to package directions. Drain the liquid from the can of chunk crab meat or if using the small scallops quickly saute them in a little butter. 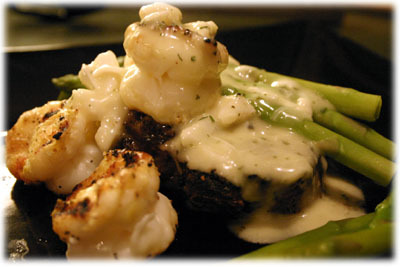 When the bearnaise sauce is cooked stir in the drained chunk crab meat or scallops to the sauce. 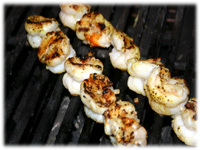 Thread the shrimp on the bamboo skewers. Rub a small amount of olive oil (or flavor infused oil) over all the shrimp. 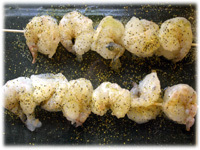 Sprinkle lemon pepper and garlic powder over all the shrimp on both sides. Cover them and set aside. Clean and oil the grates of the grill. Preheat to 600F. 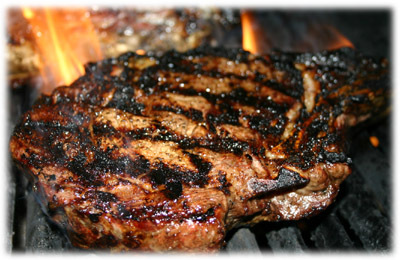 When the grills reached temperature, place the beef filets on the grill and cook 4 - 6 minutes per side. 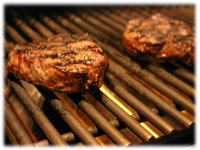 Remove from the grill when the internal temperature reaches 130F - 135F for rare or 140F - 145F for medium-rare. Cover them and let them rest for 8 - 10 minutes (while the asparagus steams and the shrimp is grilled). While the steaks are resting grill the shrimp on high until cooked through, about 4 minutes. Trim the tough ends of the asparagus stalks and place in a steamer. Cook the asparagus for 8 - 10 minutes while the shrimp cooks and the steaks rest. The real trick when your first learning how to cook Steak Oscar comes when you assemble it on the plate just before serving. 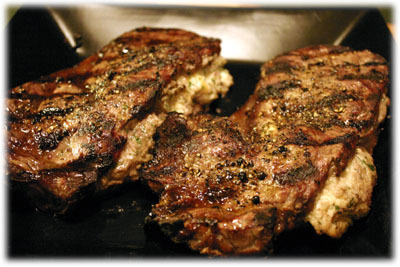 Place each grilled tenderloin on a plate and place a grilled shrimp on top of the steak and a couple beside it. Place several spears of asparagus on top of each steak and another several on the plate beside it. Carefully pour an equal amount of bearnaise sauce crab or scallop mixture over each steak and a little over the asparagus and shrimp on the side.